We’re coming up on a tenth anniversary so Kevin Drum remembers Paul Wolfowitz. Paul Wolfowitz’s “fanciful” testimony before Congress, of course, had come a week earlier, when he told Congress that Eric Shinseki’s postwar troop estimates were “wildly off the mark”; that there was no history of ethnic strife in Iraq; that Iraqi civilians would welcome an American-led liberation force; that “even countries like France will have a strong interest in assisting Iraq in reconstruction”; and that published estimates of the costs of war and rebuilding were way too high. It was an epic tour de force of wrongness, quite possibly the wrongest war prediction since Allied generals figured that troops would be “home by Christmas” after the start of World War I.
I want to be sure you got this part: he said there was “no history of ethnic strike in Iraq”. I could say that all day and weep. Did any of those Congress critters listening that day remember the 1991 Gulf War? Or the Shia slaughter in the South? Guess not – heads nodded, guns were loaded and boys went off to die and 18 months later Iraq was on fire in an ethnic Civil War. But Wolfowiz is still in the fold, still considered to be a serious person. He was even appointed – by Bush – to lead the World Bank. A prophet once anointed is always a prophet I guess, no matter how reality later unfolds. I can’t remember him without also remembering Ahmad Chalabi. He would be Iraq’s savior and leader said Wolfowitz. He has a great following inside Iraq said Wolfowitz. 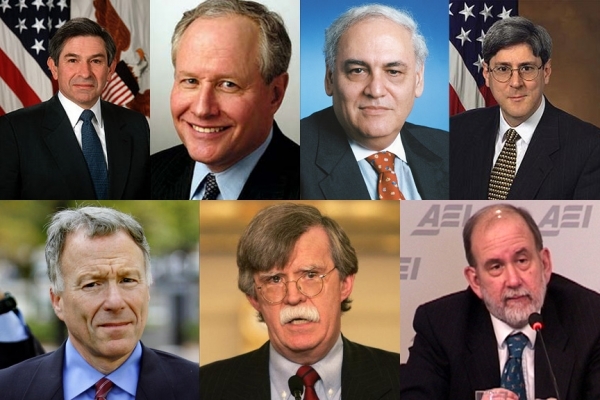 they’ll flock to his side nad support him said Wolfowitz. (At the time, Chalabi was wanted for banking fraud around the Middle East, but no matter), he was a savior and would be loved said Wolfowitz. For the hard-liners at the Defense Department, the raid came as a surprise. Secretary of Defense Donald Rumsfeld and his senior deputies, Paul Wolfowitz and Douglas Feith, got the news from the media. When Iraqi police, guarded by American GIs, burst into the home and offices of Ahmad Chalabi and his Iraqi National Congress, looking for evidence of kidnapping, embezzlement, torture and theft, the men who run the Pentagon were left asking some uncomfortable questions. Until at least very recently, Chalabi had been the darling of these top Pentagon officials. How could it be that the men who run the most powerful military in the world could not know that their own troops were about to run a raid on a man once regarded as the hope of free Iraq? Before the invasion, at the 2003 State of the Union, Chalabi sat smugly next to Laura Bush as her war-hungry husband named the ‘axis of evil’ and set the stage for the disaster to come. Great moment. Good times. 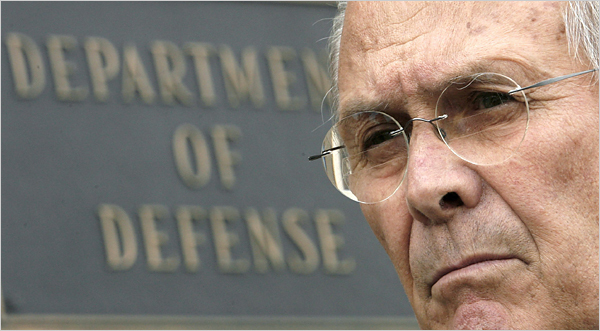 Maureen Down in the NY Times today looked upon Donald Rumsfeld and found it distasteful. As she should. “Major Gen. Glen Shaffer, then the director for intelligence for the Joint Chiefs of Staff and the secretary of defense, responding to Rummy’s request to know the “unknowns” about Iraqi weapons of mass destruction, wrote “We range from 0% to about 75% knowledge on various aspects of their program.” Schaffer wrote.